What does the itinerary for my Great Ocean Road Sunset Tour look like? Our Great Ocean Road sunset tour is your opportunity to enjoy one of Australia’s most stunning views at its most beautiful time of day. The scenic journey in our bus along the Great Ocean Road is a highlight in itself, the perfect prelude to the main event. Departing Melbourne at around 10.00am, we enjoy panoramic views of the city and Port Phillip Bay as we cross the Westgate Bridge, Australia’s longest at just under 2.6 kilometres in length. We pass by and learn a little about Victoria’s second largest city, Geelong, as we make our way towards the Surf Coast, with its enchanting beach side towns and powerful swells. We make a brief stop at the town of Anglesea, for a chance to walk alongside the beautiful Anglesea River, before continuing the scenic journey along the Great Ocean Road. The scenic journey along the Great Ocean Road is a highlight in itself, as we absorb some truly amazing coastal scenery, with new views being revealed around every bend. We make plenty of scenic stops, including of course a photo opportunity at the Great Ocean Road Memorial Arch at Eastern View. At the township of Kennet River we break for lunch (own expense) with an opportunity to stroll among the sweetly-scented eucalypts to locate some of the local koalas in their native habitat. The koala population here is particularly strong and numerous sightings are guaranteed. 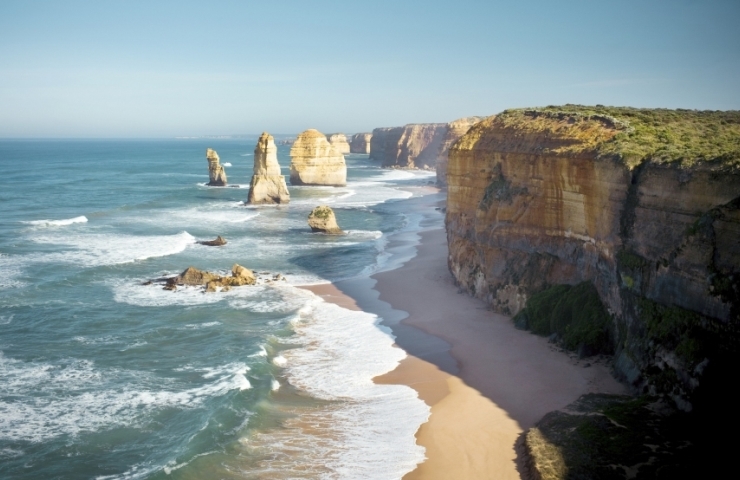 Book your Place on our Great Ocean Road Sunset Tour from Melbourne Today! From here we travel onwards through the Otway Ranges to the Shipwreck Coast and the iconic rock formations of the Port Campbell National Park. Our first stop here is the stunning Loch Ard Gorge where 52 lives were lost and only 2 souls survived the wreck of the Loch Ard in 1878. Your guide will recount the legend of the Loch Ard, bringing the gorge to life in a way you never imagined. We take time to explore here, with more rock formations to see, including the Razorback, the Dumpling Pots and the delightful Island Archway. As the sun approaches the horizon we make our way to our final sightseeing destination. You will be awestruck by the majestic monoliths of the Twelve Apostles. Enjoy a genuine spectacle watching the colours of the sky & the land transform in the evening light. We break up the homeward journey with a dinner stop (own expense) in the regional town of Colac. We then continue on, enjoying a stunning view of the illuminated city as we again cross the Westgate Bridge on the approach to Melbourne. With drop off right back to your inner city accommodation, you’ll remember this day as a true highlight of your Australian holiday.